WE HAVE SOME OF THE MOST EXPERIENCE INSTALLERS IN THE AREA. #1. THE FIRST STEP IS FOR US TO COME OUT AND LOOK AT YOUR YARD/GARDEN OR PLACE OF BUSINESS THAT NEEDS SPRINKLERS. #2. AFTER WE VIEW THE AREA WE WILL BE ABLE TO DETERMINE THE TYPE OF I RRIGATION SYSTEM NEEDED FOR EACH LOCATION. WE WILL DRAW A BLUE PRINT OF THE WORK TO BE DONE TO DISCUSS WITH YOU. ALL OF OUR ESTIMATES INCLUDE ,TAXES,PERMITS AND ANY LICENSES NEEDED. WE WILL DESIGN A CAD OF YOUR ENTIRE YARD AND MAKE SURE THEIR IS 100% COVERAGE OVER ALL AREAS. WE WILL HYDROZONE ALL AREAS SO YOU CAN HAVE CONTROL OF EACH ZONE AT YOUR FINGER TIPS. 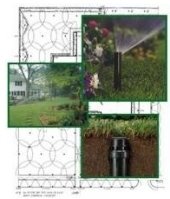 We will provide all of our installed customers with a detailed plan on your property or area you want to water.The plans all have water pressure to each head on them and how much each zone is opperating at. So it tells you were rotors and sprays will be placed. Rotors - The PGP, Hunter Industries' flagship product, is the leading seller for large lawns and comes with a 2-year factory warranty. The Hunter I-20 has a 5-year factory warranty. ran for short periods of time. to fit virtually any residential or light commercial need. It’s designed for flexibility right at the job site. It’s designed to keep an installer’s inventory to a minimum. What is it? It’s the modular design of the new Hunter Pro-C controller. Beginning with a 3-station base unit, the Pro-C can be expanded with up to three more 3-station modules. Thus, a contractor no longer needs to stock eight different types of controllers (3-, 6-, 9- and 12-station units in both indoor and outdoor models)…he simply needs to keep on hand just three items (indoor and outdoor Pro-C base units and 3-station modules). There are several different control panels that we install depending on how many stations you will need. Rainbird is another great controller it has all the features you will need . The dial is color coded to help you set, change or just correct the time.